We prepare all Homefree products with great care in our own dedicated baking facility. From kitchen design, to staffing, to ingredients, Homefree treats are made with allergy safety in mind. No peanuts, tree-nuts, eggs, wheat, dairy, soy (except lecithin), fish, shell fish, or sesame are permitted in our facility for any reason at any time. The only soy in our facility and some of our products is soy lecithin, which is tolerated by most (but not all) people with soy allergies. Our kitchen is dedicated gluten-free as well. Our delivery area is separate from the kitchen, allowing us to wipe down all ingredient deliveries. 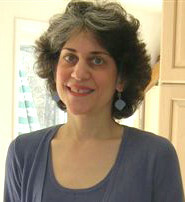 And our well-trained staff members wear Homefree clothing and shoes to avoid carrying in allergen traces. Not only do we keep allergens and gluten out of our own facility, but also we are careful about where our ingredients come from, including requiring allergen and gluten documentation from every ingredient supplier. And we go further by allergen testing the ingredients for peanut, almond, egg, and milk proteins. Additionally, we randomly test our cookies for these allergens and for gluten. We hope you will be as comfortable eating from our kitchen as you are from your own. our products are featured here! Everyone wants to be sure that the food they eat and feed their families is safe. We are proud to share that the tremendous level of care we use has been validated by an extensive, internationally recognized food quality and safety audit: Homefree is certified by Safe Quality Food (SQF). You and your family will love eating these treats, and you can feel great that they are full of good things, with no cholesterol or trans fat. All are low in sodium, all contain fruit juice, and some are even low glycemic. All Homefree treats are Non-GMO Verified and some are even certified organic (made with at least 70% organic ingredients). We want everyone to be able to join in when treats are served. So all Homefree treats are also certified Vegan (by Vegan Action) and Kosher Pareve (by OK). And of course, Homefree treats are always certified gluten free, and always free of peanuts, tree nuts, eggs, dairy, and wheat. Trying to eat more whole grains? We make it easy! With Homefree treats, just a 1 ounce serving provides at least 1/2 a serving of whole grain of the 3 recommended daily servings. And the treats taste so great, you won’t even be able to tell that they are made with whole grains. So wholesome and delicious that some Homefree cookies are even on the Smart Snacks list used by schools and other institutions nationally. Homefree is proudly a B Corporation for our strong commitment to environmental and social responsibility. We have never used genetically modified ingredients, and we support the non-GMO movement by having all of our products non-GMO Verified by the Non-GMO Project. We additionally use ingredients that meet standards for organic production, and some of our cookies are certified organic with at least 70% organic ingredients. Testers raved about these tiny, tangy treats, which reminded them of the lemon-flavored Girl Scout cookies. They’re made with whole-grain oat flour and lemon juice and extract. 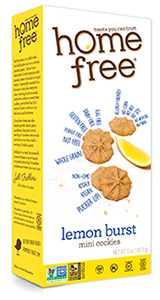 Homefree mini-cookies are delicious snacks that also happen to be healthy. They have won numerous awards in the Healthy Gourmet Snack Awards presented by Taste TV, including Four stars for “Healthiness“, and they deserve them. A team of editors judged entries based on taste/quality and innovation. As the mom of a child with food allergies and as a clinical psychologist, I know how important it is for people with special diets to be able to enjoy treats. I especially wanted it to be easy to include everyone when serving food at social occasions, where a sweet treat is often part of the fun! So I created these cookies to be delicious and inclusive. Homefree treats are also bursting with whole grain goodness. Imagine, every serving of cookies deliciously provides more than half a serving of whole grain! Indulge in a treat for yourself, or serve these to your family or guests, knowing Homefree cookies are treats you can trust.